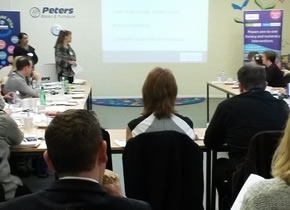 I was recently able to catch up with Catch Up® schools in the Birmingham area, at our ‘Implementing and sustaining high-impact literacy and numeracy interventions’ lunchtime seminar, held at Peters Books and Furniture on 29th January. Having delivered over 20 courses in a little over two years, it was wonderful to be able to showcase some of the impact our work has had on learners in and around Birmingham. As a trainer, and as a SENCo who also uses both Catch Up® interventions in her own school, I’m well aware of the impact. However, it’s always great to be able to share other deliverers’ successes! Two local schools – Wheelers Lane Primary and St Peter’s Catholic Primary – were ‘persuaded’ to present case studies about their use of Catch Up®…. to a room full of Headteachers and SLTs….no mean feat! Both schools did a brilliant job in conveying the impact of Catch Up® on their learners, in terms of reading and number age gains, and improved confidence. At the end of any Catch Up® training, we welcome new deliverers and coordinators to the Catch Up® community…..I suspect the Catch Up® community in the Birmingham area will continue to grow, certainly if the feedback from the session (both immediate and via evaluation) is anything to go by. Looking forward to my next training event in March!